There are seven letters that represent all Roman numerals. They can be used alone or in various combinations to make every number. Write the following using Roman numerals. Why do you think Arab scholars dropped Roman numerals and began using the Hindu system? Why do you think people use Roman numerals today? What effect do you think the development of zero (0) has had on mathematics? 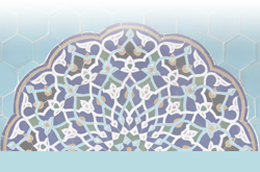 Islamic mathematics laid the foundation for modern math. Al-Khwarizmi (780-850 CE) was one of the first mathematical faculty members at Dar Al – Hikma or House of Wisdom in Baghdad. This place was dedicated to teaching and learning. Al – Khwarizmi wrote 2 mathematical text books. One dealt with solutions to mathematical problems with an unknown quantity. His second book introduced the Hindu numbering system, which is the 10 numbers 1,2,3,4,5,6,7,8,9, 0 that we are familiar with today. 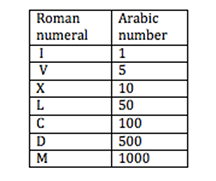 Before these numbers, people were using Roman numerals to write numbers.